Are you caught overriding the traffic rules? Just pay a Yellow Note (500) to a cop, and you’ll be set free. Are you running helplessly to get your Driving License? Well, pay three or four such notes to the clerk in the RTO office, and you can get your license in no time. Do you want to get a tender for a major government project, pay x% to the respective ministry or the officer and you can have a peaceful sleep and get up next morning to hear that you have got the tender. And the list of anecdotes goes endless. This is the situation today in Independent India. Thanks to the Anna Hazare Movement, at least people are thinking about the extent of corruption happening in India. But there are more critics in India than anywhere else who just spend loads of time critiquing the system and doing nothing. The most common statement that one gets to hear from them is “Had Mahatma Gandhi been alive today, he would have hanged himself to death.” Well, I am not really sure if that would happen, but my salutations to all those great critics. Mahatma Gandhi is one unforgettable soul not just in the Indian sub-continent, but across the globe. Today being the day when he entered this world one hundred and forty two years ago, I thought of writing a short note. Celebrities just live and die, whereas Legends live and die to live forever. Mohandas Karamchand Gandhi was not the only one to be born on this famous day in Indian History. Another great gentleman, a great leader in the freedom struggle who later rose to become the second Prime Minister of India, Lal Bahadur Shastri also was born on the same day. Gandhiji is remembered very well by this generation not only because October 2nd is celebrated across India as “Gandhi Jayanti” but also because they see him on every single piece of currency that they spend. However, hardly anyone in India knows about the other Legend. Or probably the legend already became history and is lying in the archives of the Indian libraries. If India ever had a corrupt-free politician, it would be HIM. Even Mahatma Gandhi is an epicentre to myriad controversies but if there was a man who had none, it is HIM. Probably his death was the only conspiracy in his entire life. Honestly, I’m not a fan of Mahatma Gandhi, neither do I despise him, but the nation already knows enough of the good and bad about him. Hence, I wish to write about this modest gentleman, Lal Bahadur Shastri, whose exemplary life is an inspiration to many of us in the current generation. Lal Bahadur Srivastava was born in 1904, 7 miles from the historic city of Varanasi, in Mughalsarai. He had his early education in Mughalsarai and Varanasi. He dropped ‘srivastava’ from his name purely because it was just a caste identity. In 1921, inspired by the former gentleman Gandhiji and Bal Gangadhar Tilak, he discontinued his studies and joined the freedom struggle. Later, he joined the Kashi Vidyapeeth and earned the epithet ‘Shastri’ by obtaining a degree in Philosophy. He was an active member in the freedom struggle. Though he escaped imprisonment in his earlier days owing to him being a minor, he was jailed later on during the civil disobedience movement for two and a half years. When he was jailed during the Quit India movement, his daughter was seriously ill and on her death bed and he requested the authorities to grant him a leave. He was granted a leave for 15 days on condition that he would not participate in the freedom struggle. Even before he reached home, his daughter passed away. So, he immediately returned to prison after performing the funeral rites of his daughter, even before the expiration of the period. A year later, his son caught a severe influenza and he came out on a week’s leave. Despite his family’s pleadings, he voluntarily returned to prison right after a week, though his son was not completely well by then. Such are the high standards of ethics and morality of this great leader. Later, in 1940, he was sent to prison for a year for his voluntary support to the satyagrah movement. After his release, when Mahatma Gandhi issues the Quit India Speech in Mumbai, Lal Bahadur Shastri travelled to Allahabad, and sent instructions to freedom fighters from Anand Bhavan, Nehru’s ancestral home. He was later arrested and jailed until 1946. In totality, he spent nine years in jail. During his imprisonment, he spent his time reading books and familiarized himself with the works of western philosophers, revolutionaries and social reformers. He also translated the autobiography of Marie Curie into Hindi. He is remembered by the country for his tenure with the Indian Parliament. He was the first one to appoint women conductors, as the Transport Minister for Uttar Pradesh. He was the one who suggested that the police use water jets instead of lathis to disperse unruly crowds. He played a very important role in the landslide victory of the Congress during the 1952, 57 and 62 General elections. He served as the Minister of Railways and Transportation. He offered his resignation owing to a moral standpoint after an accident at Mahabubnagar claimed 112 people. It was rejected by Nehru. Three months later, another unfortunate incident near Ariyalur in Tamilnadu claimed the lives of 144 people and this time, he insisted that Nehru accept his resignation and stepped down publicly. Such is the extent of moral responsibility this person held, from the core of his heart. Later in 1961 when he became the Home Minister, he was instrumental in appointing the committee on ‘Prevention of Corruption’. Once under the PL480 programme, America was about to send inferior quality wheat to India when he intervened and proclaimed that the entire nation would rather go hungry once a day than accept inferior quality wheat from the States. Before the announcement, he even instructed his wife not to cook dinner. Such was the integrity of the man who walked his talk in every facet of his life. Though he ended up ineffectual in dealing with the economic crisis and food shortage in the nation during his short tenure, he supported and promoted the Green Revolution and White Revolution, though he did not live to see the fruits of it. The National Dairy Development Board was formed during his tenure after the successful experiment at Anand. Though he was a socialist, he was very keen that India can’t have a regimented type of an economy. He even visited many countries to understand their economic policies. During the 22-day war with Pakistan, he raised the slogan “Jai Jawan, Jai Kisan” underlining the need to boost India’s food production. His unfortunate demise at Tashkent on January 10th 1966 is a great loss to the country. Though it is believed to have happened under suspicious circumstances, the government has never taken any steps publicly towards investigating the case. His widow, Lalita Shastri persistently alleged that her husband was poisoned, but ultimately in vain. It is believed that he has been completely pushed into the background post his death. Kuldip Nayar, Shastri’s Press advisor till 1964 states that he is sure of a Congress conspiracy to underplay Shastri after his death. He was the only common man in his time who rose to become the Prime Minister of the country thereby setting an example that even a common man can enter politics and make it big in India. However, after his death, the dynasty rule returned to India with Indira Gandhi taking over the reins. He appeared modest, but he is a man of steel. One and only ‘politician’ who made no money, one man of the highest integrity and devotion to his ideas, he was always down to earth and a real son of the soil. Indira Gandhi, his successor, ruled the country for 16 years and Nehru, his predecessor, ruled the country for 17 years, whereas he ruled the country for a little period of 18 months in between. Had he been with us for at least 5 more years, he would have definitely brought in revolutionary reforms to the country. And the country would have definitely been in a better shape many years ago. These days, every year on October 2nd, we see every single politician in India paying their respects to Gandhiji, and recently, we also started seeing Governors and Chief Minsters organizing rallies and encouraging youth to take oaths of truth, non-violence and peace. However, against everything, if every politician visits Lal Bahadur Shastri’s Samadhi at Vijay Ghat every year on this day, pays his/her respects to this magnanimous soul, and take an oath that they would maintain integrity, values and work ethic in spirit and action, India would be definitely a different nation. 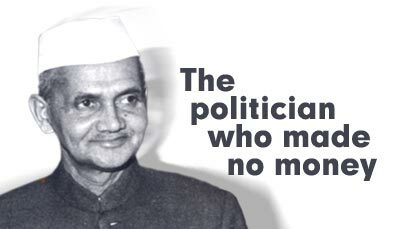 Lal Bahadur Shastri remains forever as an epitome of an ideal politician and an effective leader for all the generations to come. There are definitely a lot of lessons from his life, which each one of us should embed. This reminds me of a short story. In a kingdom, there was a famous sculptor. He was ordered by the king to make a statue to be erected on a pillar in his capital. One day, the king was walking in disguise and saw him sculpting a statue and went to him. There was already a statue lying to his left. The king asked him why he was sculpting another one when there was already one ready. He replied that there was a small dent on its nose and hence, he was sculpting another one. The king remarked that the statue would be anyway installed on the top of the pillar and that no one could see it. The sculptor replied that he knows of the defect even if no one notices it and that is enough not to let him sleep. This is the kind of ethic that each one of us should try to build in our lives. Shastri always had a saying of Guru Nanak on his desk which read, "O Nanak! Be like the tiny grass, for other plants will wither away, but the grass will ever remain green". So, let us try to adopt the modesty and let the life of Lal Bahadur Shastri be a true inspiration to many of us. Let us hope that at least we remember him every year on this day and share his story even with the next generation so that he remains evergreen and is not lost as another dusted attic in history. Long Live Lal Bahadur Shastri. Wonderful article, Uday. I agree with what you said that though people remember Gandhi's bday, very few remember LBS bday. His life truly is an inspiration to many ! Thank You PS and Rohit. LBS is one highly eclipsed political figure in the country. He needs a little more publicity or else, a legend like him will be forgotten by the next generation.